Morning! DRK Nails send me a couple of their plates and for this mani I used one of them. There's 2 in this post, the others will be in upcoming posts, so keep an eye on my blog if you wish to see more of them! These 2 plates are fully covered with designs that work well on their own, but also flow nicely into the next, so you could combine them any way you see fit! I used the above plate for today's mani, and took an image from the top, so I could easily line it up on all nails. The plate below is one that I haven't tried yet, but it has plenty designs that I can better envision on my nails, and I think the way these images are linked together (especially the bottom row), opens up a lot of possibilities. And these also look perfect to stamp diagonally! These 2 plates are from the DRK Nails Designer series, which contains a couple of plates in this size, and 2 XL plates (I blogged about one of them last year). The plates come in plastic, with the usual protective blue plastic on the front, and a hard plastic back. To give you an idea of their size, the metal plate itself measures 6x12 cm, with the white back the whole thing is a bit larger of course. 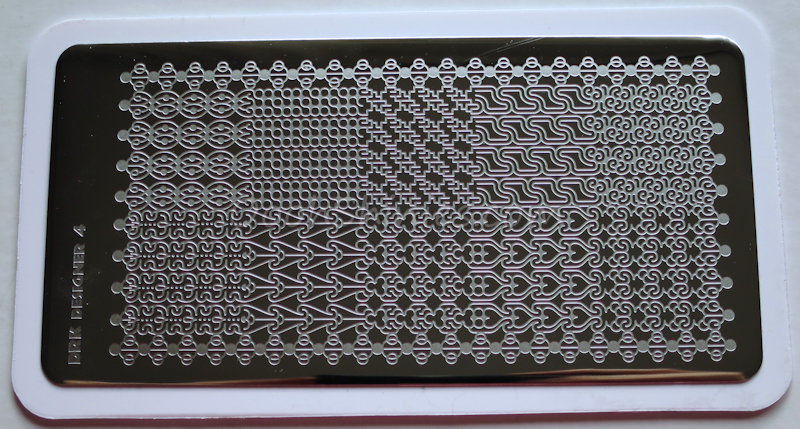 The designs are on average 5.2x10.5 cm. And if you look at DRK Designer 4, you can see 10 images that can be used on their own, even though they're all linked, those are around 2.1x2.1 cm. That'll make those 10 images nice for people with longer nails as well! 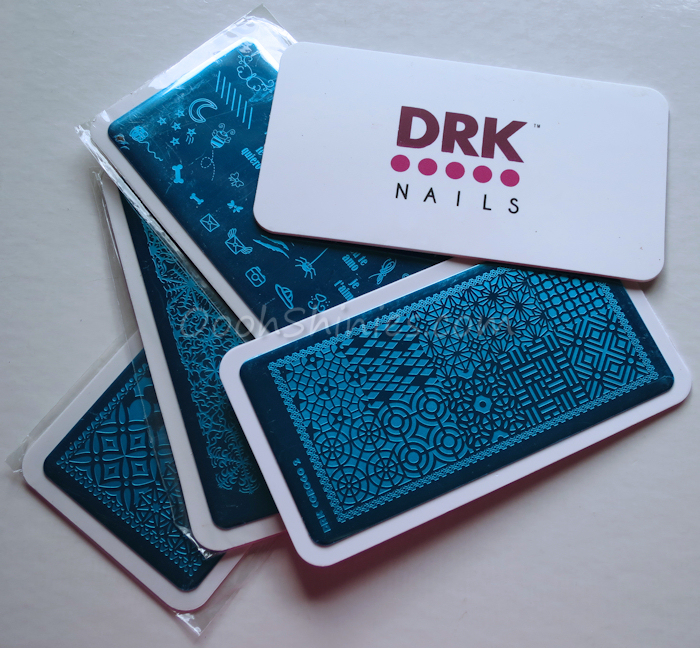 I've used a bunch of DRK Nails plates throughout the years and they all work great, and these are no exception. 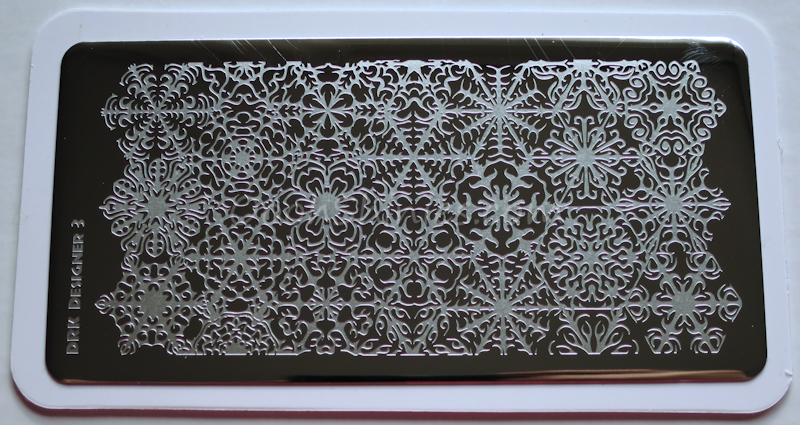 And because the designs are fairly deep, they give you more time to stamp! So if you struggle with transferring the design fast enough, the DRK Nails plates could be a great choice as well :) You can find all their plates in their webshop, and these plates cost $6.50 each. Essence Enter Wonderland with China Glaze Something Sweet, Kinetic Candy and Sweet Hook, stamped with China Glaze LOL And DRK Nails Designer 3.